Colonel Robert Hammond's Regiment have gained experience working on several film and documentary sets and are particularly looking forward to the autumn 2010 release of Inspired Productions documentary on the history of Ireland, working with producer Charles Sandbach, presenter Robin Thompson and acclaimed cameraman Ian Livesey on the camera. 'The second half of 2010 looks bright for Inspired. After its release via Reality in the USA on May 25 2010 - 'A War to End all Wars' reached No.4 in the US Amazon.com charts in its category within two weeks, out-selling many big name titles, a superb achievement that is fully endorsed with great reviews. 'The Seekers Guide to Harry Potter' & 'Ireland...The Story of a Nation' are set for worldwide release this autumn with major distribution from the two largest film distributors in the world'. A number of Colonel Robert Hammond's Regiment took part in this historical mini-series - representing new model army troops in Ireland. The filming took place in several locations, and its always good fun playing 'Spot the Hammond'! 'Starring Owen Roe as Oliver Cromwell, Declan Conlon as Hugh Dubh ONeill and Catherine Walker as Elizabeth Price, Cromwell in Ireland is directed by two-time IFTA winning director Maurice Sweeney and presented by leading historian Dr Micheál Ó Siochrú. Airing to coincide with the 350th anniversary of Cromwells death on 3rd September 1658, the series consolidates Ó Siochrús fascinating take on this crucial time in Irish history. 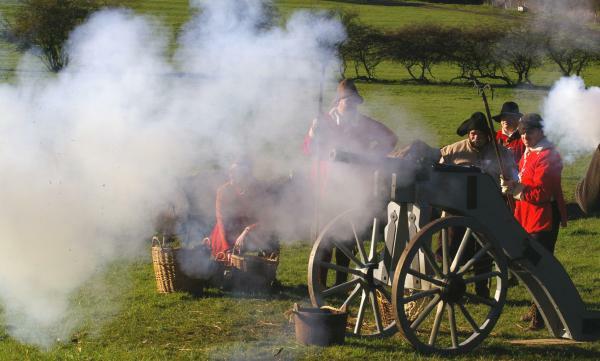 An estimated 500,000 Irish people died from war, plague and famine during Cromwells military campaign, making it one of the greatest catastrophes ever to befall the country. But strikingly, Micheál reveals how Gods Englishman helped to lay the foundations for the modern Ireland that we know today'. 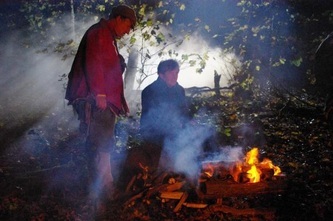 MAYA VISION International working for the BBC on a series called English Story and will be presented by the TV Historian Michael Wood. The series will be based around the old parish of Kibworth in the hundred of Gartree, which today comprises of Kibworth Harcourt, Kibworth Beauchamp and Smeeton Westerby. It’s a wonderful place seated in the very heart of England; it has a Roman past, straddles the dividing line between the Vikings and the Saxons and is rich in records and documents. 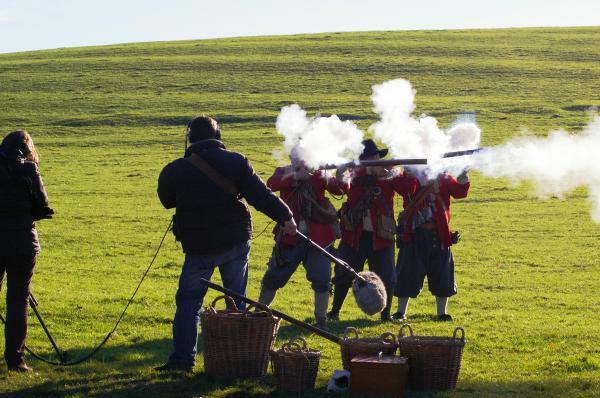 The series will set the lives of the local people against the backdrop of national events: the Norman Conquest, the Black Death, the Civil War and the agricultural and industrial revolutions. 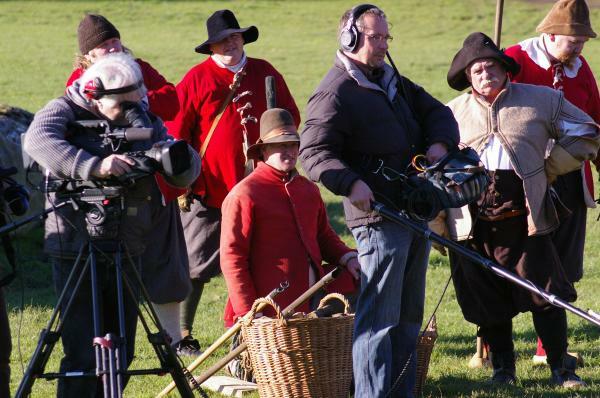 Members of Hammonds Regiment assisted with the filming of large scale troop manouvres, although members of our good friends Lord Greys Regiment of Foote are being heavily featured as this regiment recruited at Kibworth in the Civil War. Hammond's Regimental Drums and Colours were asked to support an Arts Council funded event at Nottingham Castle in February 2013, promoting the history of Nottinghamshire and Derbyshire through the ages. We were unsure of what to expect, but once we saw what Elemental Force (the production company) were proposing, we couldn't wait to see what happened. Briefly, they invited members of the public to the castle, asked them to enjoy the spectacular 'Fire Garden', then our drums and colours lead over two thousand people up to the lawn in front of the castle, upon which they projected images and fired fireworks in coordination with specially commissioned soundscapes. Overall the experience was magic and we hope to be able to help out in the future. (Images are available in the Gallery).